Part of the School of Life series of books or as they call them ‘new guides for everyday living’, How to Change the World by John-Paul Flintoff does what it says on the tin. It gives you tools to know how to make a difference, making a distinction between changing the world and saving the planet. It took a while to get going but I really enjoyed it in the end. It helped that the awesome Meaning Conference came slap bang in the middle of reading it. There were consistent themes across both the conference and the book, making the outcome more powerful. My big takeaway from both was ‘the power of small actions’. Here’s some highlight quotes from the book. Creating change brings benefits for ourselves as individuals – we discover deeper reserves of empathy and opportunities to be creative. Better still, it turns out that changing the world produces a deep lasting, sense of satisfaction. When we are immersed in activities we love, we are living by our intrinsic values. How can I make my life meaningful? Anything that alters consciousness in the direction of unselfishness will do. What would you do if you knew you were certain to succeed – if failure was, magically, impossible? To get to the heart of the matter, we must keeping asking ourselves why something is a problem. If you don’t know what to fix, it can’t be done. Freedom is, by definition, people realising that they are their own leaders. The best works of art can reconnect us to sources of energy and engagement that can be stifled by routine and habit. A good world is not a world where everybody fixates on global problems according to some externally imposed framework of ‘importance’. A good world is one in which people find meaning in the particular things they do – and that means a world with a place for beauty, creativity and play. …a technique that we could all use to find motivation, whatever our mission of change: they sent themselves, in effect, a cheerful postcard from the future. They used ‘imaginary hindsight’ to picture what the world could be like (once their goal has been accomplished). Then they worked out, backwards, how to get there, year by year. When it comes to trying to change the world, it no good campaigners shouting through a megaphone at anonymous millions. They must start with those closest to them. If they are not good neighbours, then why should anyone listen? Nobody achieved anything except in small steps, one after another. Here’s a 15 minute talk the author gave at The School of Life event in London recently to give you some inspiration. 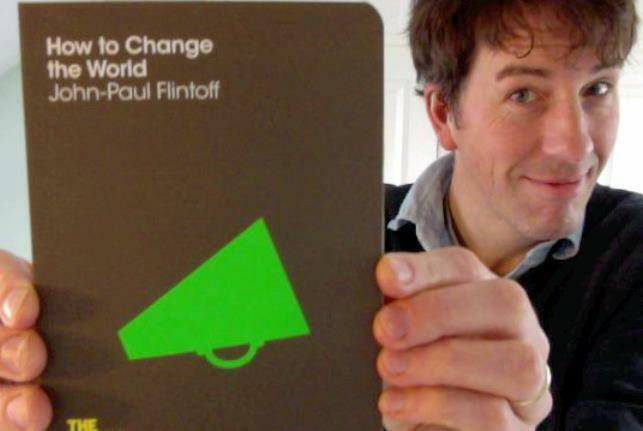 John-Paul Flintoff on How to Change the World from The School of Life on Vimeo.